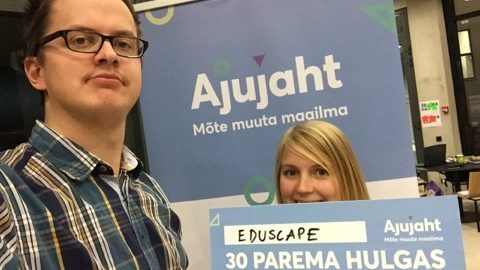 EduScape’s escape games have started with the idea of ​​bringing an escape room to the classroom. EduScape is created by Luise Tiks and Kaarel Türkson – Rakett69 science show participants, chemists and inventors. Luise is a full time science teacher and the idea to bring escape room to learning environment arouse from the need to make students more interested in sciences. The teaching experience gives broad enough knowledge about the curriculum and teacher’s needs to develop a game that is not only interesting but easy to use and fulfills its purpose. Kaarel is a student and science popularisation activist. He has experience from Rakett69 production where his job was designing tasks for competitors to solve and he has strong interest in chemistry. In addition we have Grete Tiks and Merike Saarepera in our team. Grete deals with marketing and finance and Merike is the designer and helps to build the escape room equipment.